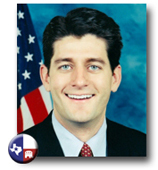 Congressman Paul Ryan is the Republican Vice Presidential nominee. Born and raised in the community of Janesville, Paul Ryan is a fifth-generation Wisconsin native. Currently serving his 7th term as a Member of Congress, Paul works to address the many important issues affecting Wisconsin residents and serve as an effective advocate for the 1st Congressional District. "I hear some people say that this is just 'the new normal.' High unemployment, declining incomes and crushing debt is not a new normal. It’s the result of misguided policies. And next January, our economy will begin a comeback with the Romney Plan for a Stronger Middle Class that will lead to more jobs and more take home pay for working Americans."